A short explanation of revolutionary syndicalism and industrial unionism as well as some notes on their histories. Syndicalism refers to the practice of organising workers into unions to fight for their interests. Originally, the term comes from the French work for Trade Unionism (Syndiclisme), but in English the term specifically refers to rank-and-file unionism. There are two major tendencies: Revolutionary Syndicalism, typified by the French CGT, and Industrial Unionism, typified by the Industrial Workers of the World (IWW). A related tendency is anarcho-syndicalism, but its specifically anarchist politics differentiate it from syndicalism, which is purely economic, or 'non-political'. The idea behind syndicalism is to create an industrial, fighting union movement. Syndicalists therefore advocate decentralised, federated unions that use direct action to get reforms under capitalism until they are strong enough to overthrow it. Despite these different origins, Revolutionary Syndicalism and Industrial Unionism converged on a very similar approach. The central idea is that trade unions divide workers by trade, which can (and has) end up in scabbing. In America, industrial disputes would sometimes see violent clashes between workers of different unions who would ignore each other’s requests to respect picket lines. The aim of syndicalism is to unite all workers into ‘One Big Union’ controlled by the members, from the grassroots. This is obviously in deep contrast to the current reformist unions who are filled with layer upon layer of bureaucrats who can call off industrial action regardless of the wishes of the membership. This kind of union democracy puts control of workers’ struggles where it belongs: with the workers themselves. When the industry of the world is run by the workers for their own good, we see no chance for the problems of unemployment, war, social conflict, or large scale crime, or any of our serious social problems to continue. Principles of Syndicalism - Tom Brown - Article by the well known activist explaining the how syndicalist unions organise, and the new society they aim to create. Syndicalism: What It Is - Gaylord Wilshire - Brief explanatory article by an editor of The Syndicalist. What is the union? - Emile Pouget - Essay outlining the aims, priniciples and functions of unions. The General Strike - Ralph Chaplin - Classic IWW text on the concept of the general strike as a tool for change. Syndicalism in South Wales: The Origins of The Miners’ Next Step - Article on the development of syndicalism in South Wales. I can't speak much on the CGT, but I think this article makes a couple inaccurate statements on the IWW I'd like to address. If this is meant to include the IWW as well, as a syndicalist union, then it is categorically wrong. The IWW does not and never has advocated for a federated union structure, instead it has, from its inception, called for the construction of the One Big Union, which is a unitary structure divided into departments and branches (which you do contradictorily state later). While all of this is accurate to an extent, it makes it sound as though anarchism and anarchists played no role in the creation and operation of the IWW. There were anarchists present at the founding convention and throughout its entire life, the IWW has had prominent anarchists in its ranks, running and organizing the union, from 1905 to today. Not to suggest that its organizers and officers were all anarchists. As well, I don't think it's correct to say that the IWW's roots are from the Marxist tradition. Instead, depending on how you define "roots", the IWW ideologically came largely from Class Struggle Unionism, or less developed ideas of Industrial Unionism. Never the less, Marxism, as well as anarchism, political (electoral) socialism, and Industrial Unionist-style syndicalism all played an important role in the foundation of the IWW. [...] Industrial Unionism (as per the 1905 IWW constitution) [...] [is] non-political, aiming to build unions for all workers regardless of political persuasions. Finally, this statement about the non-political organization of the IWW is simply not true. 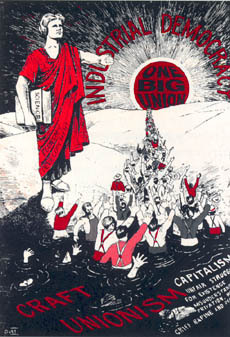 In 1905, Daniel De Leon, of the Socialist Labor Party, one of the groups that co-founded the IWW, pushed through a statement into the Preamble calling for electoral action of the workers to bring about change (interesting to note that this immediately proceeded a sentence suggesting that electoralism is useless). This difference in ideas of electoralism and non-involvement in electoralism eventually led members opposed to electoralism (many of whom were anarchists!) to basically lock De Leon out of the 1908 convention where he was expelled and his supporters left in protest. The clause that De Leon had added to the Preamble 3 years earlier at the founding was then removed. I mean, I get that is has the GEB, but even now, motions come up through branches and the voting structure at convention is one branch, one vote with branches have the ability to amend and tweak the motions of other branches. Additionally, branches - with their own individual bylaws - can basically do what they like given that it doesn't contradict the principles laid out in the constitution. That's all pretty federated. As well, I don't think it's correct to say that the IWW's roots are from the Marxist tradition. I get what you're saying here (mostly in your following sentence), but theoretically the IWW does owe a whole hell of a lot to Marx. As this article states, half the damn preamble is a is either a paraphrase or a direct quote from the man.